Enjoy evening sunsets from the large balcony that extends from the master bedroom and the living room and looks directly out to the beach. There is a 2nd balcony looking onto the Intracoastal Waterway from the 3rd bedroom. Sea Gate boasts one of the largest outdoor heated pools in the area and the pool lies beachside, along with cabana tiki huts and barbecue grills for you to enjoy picnics. Whether you are walking the beach, collecting sea shells, or just soaking up some sun on the sand, I hope that your vacation here will be a treasured memory. 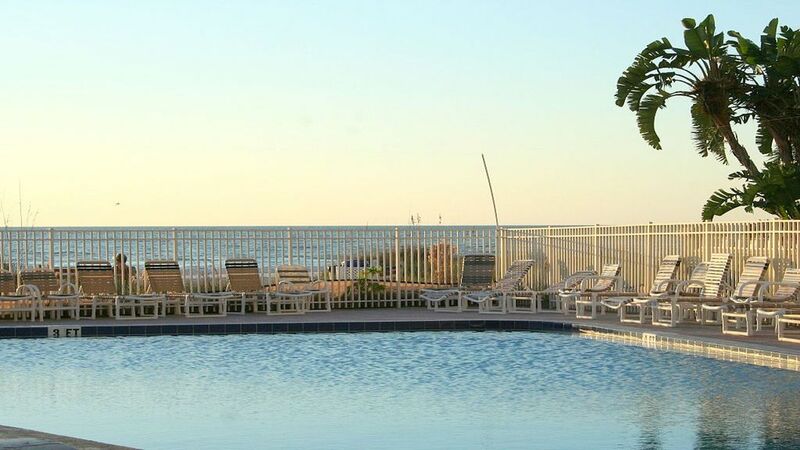 My Sea Gate condos are 3BR/2BA, direct gulf front, each decorated to showcase their own unique charm and offers fully-equipped kitchens, full sized washer and dryer, and all linens are provided. Floor plans are identical. There is plenty of free onsite parking as well as an elevator and 2 sets of covered stairs at Sea Gate. So remember, 'if you book it, you can come' and enjoy our SAND, SEA, SHELLS and SIZZLING SUNSETS, at the 'Sea of Dreams' on Indian Shores Beach. My Family and I have lived on Indian Shores Beach for many years. The town has grown dramatically since the 80's...and fortunately, has been able to hold onto it's small town quaintness that draws visitors back year after year. 2 fully equipped bathrooms, Master Bath, ensuite, has a glass enclosed shower only, there is a step up into shower..
Condo sits along Indian Shores Beach. Direct gulf front view of the beach. Sea Gate 408 codo looks directly out to the beach from a large balcony that extends from both the MBR and the Living Room. Balcony faces due WEST towards the beach. All linens needed for your stay will be in the condo. Indoor laundry room. Full sized washer in unit. Indoor laundry room. Full sized dryer in unit. ONE RESERVED, MARKED PARKING SPOT IS AVAILABLE IN THE SEA GATE LOT. A PARKING PASS WILL BE ISSUED, 2 PER CONDO, ADDITIONAL PARKING PASS TO BE USED IN A GUEST SPOT, FIRST COME FIRST SERVED BASIS. All bath and kitchen towels will be in the condo. Sea Gate 408 is a corner unit and has a wrap around balcony...There is a also a 2nd balcony, facing Intracoastal Waterway, off of the 3rd bedroom. Largest outdoor heated pool in the area! Heated during winter months. Amazing condo on the Gulf! We just spent a week in the condo....beautiful condo....clean and lots of space for 7 of us. The view was amazing and we enjoyed coffee on the balcony in the morning and watched dolphins swimming right by us. The condo had beach chairs and umbrellas which were much appreciated as we had a super hot week!!! Thank you so much! I'm so happy to hear you found everything you needed in Sea Gate 408 and that you had a wonderful vacation! I hope you have a wonderful... upcoming summer! Our vacation couldn't be better! Tina was awesome to work with - very quick response as we were searching for a destination while traveling! The bedrooms were comfortable, the kitchen stocked with everything we needed, cozy living room furniture, but the view was what was took our breath away! If we make it back to the area, we would definitely look to book this property again! I’m so pleased Traci, to hear that you and your family enjoyed your stay with us! Thank you for taking the time to write. I’m glad you found our condo to be both comfortable and well stocked. I agree, looking out to the beach and listening to the sound of the waves is the most relaxing of all. I hope to hear from you again in the near future. This condo is perfect! 4 TV's with good cable and wi-fi, a recliner, comfy couch and chair, nice dining table and chairs. Master bed is comfortable and firm. Everything was in working order and clean! It takes a little while to get the hang of the different light switches but the motion sensor lights in the bathroom and the nightlights spread around were great to have! There are plenty of beach towels and extra towels, There was a good coffee maker with a reuseable filter so we didn't have to worry about getting the right kind. Stainless steel pans took a bit of getting used to as I normally cook on T-fal. So, next time I would bring my own. Also, might bring a knife sharpener. Other than those two things, there were adequate supplies to get started - trash bags, toilet paper, dish liquid, laundry powder. The area is very laid back and seemed to be crime free. Beach cabanas were great and we were able to spend 3 days on the beach watching fishermen and people walking. We visited a couple of local pubs and ate at the Salt Rock Grill twice. We also ordered in pizza from one place and spaghetti/lasagna from another. Food was good from everywhere. All in all a GREAT experience, and cannot wait to get back to the BEACH!! Thank you so much for taking the time to write a review on your recent stay in Sea Gate 408! I am delighted to hear you enjoyed your stay with us and found everything in the unit to be both comfortable and accommodating. Your detailed response will help the next traveler, when making a decision of what is offered, not only in Sea Gate 408, but also on Indian Shores Beach. I hope you have blessed upcoming year and hope to hear from you in the future. We checked in and went grocery shopping for the week. Around 10 pm we realized the fridge was not working properly, frozen items were going soft and the milk and drinks were not cold. We contacted the owner immediately, she shifted the responsibility to another person, on the next day at 6 pm after 14 phone calls and numerous text messages we finally got a 6 cubic ft. fridge ( for a family of 6) which only held some groceries and no drinks. We Did not get a full size fridge until Wednesday, which did not have ice or filtered water. Owner seems so irresponsible , not prepared and totally removed from the situation, all she can say if you stay at budget motel you would pay more...terrible customer service... refund is owed and merit legal action for a ruined vacation... try spending a great sum of money to end up making and receiving phone calls about delivery and maintenance issues, worrying about organic baby food getting thawed and going bad. Member of the family left midweek Ruined vacation.,,also be prepared to put condo laundry from previous renters away and dishes in the dishwasher! Unsympathetic owner, she doesn’t really care! While I am extremely sorry we had an unexpected issue with the refrigerator the evening of your arrival, I am quite taken aback by the unfactual and very misleading account of the events that you claim took place. You were very kind to my Brother, he dealt only with you, your wife, on the other hand, seemed to be extremly upset, after the fact...which is when I believe you had a change of heart. The events that actually occurred were I received your call at 10:30 pm, Sat evening, my Brother and I, who are the owners, and whom you dealt with the entire time, as well as my associate Maria, sprang into action immediately. Charles purchased a brand new 6’ temporary refrigerator and delivered it to you personally on Sunday afternoon. Appliance repairman arrived Monday, citing very unusual that a 5 year old refrigerator would completely go out without any warning. Once it was determined the refrigerator could not be repaired, Charles purchased a top of the line, new full size refrigerator and it was delivered on the very next delivery truck, early Wednesday morning to the condo. This was completely unexpected, however, in order to show our appreciation to you for your patience, we purchased a gift certificate for your family to dine at the nicest restaurant, just across the street, which you seemed to appreciate. I believe we did everything possible to remedy this situation as quickly as possible. Your family was at no time, ever without a refrigerator. I pride myself in having an extremely strong work ethic and and respond quickly to all issues. This can be verified by my past guest reviews. I am sincerely sorry you felt we did not do everything possible for you. As you know, maintenance issues arise unexpectedly. It is my hope, you took away lasting memories, in lieu of this untimely issue. Jan M.Where do you live? Beautiful place and location. Wonderful ocean views and great beach. Condo was lovely, well stocked with supplies and had plenty of room. Loved the beach supplies and towels that were available. We happily donated the 2 red beach chairs we had purchased so others could use. We did rent a couple of cabanas out front for a few days; well worth it. We would definitely stay here again. Thanks for the use of your wonderful vacation condo! I'm so happy to hear Sea Gate 408 exceeded your expectations! You were excellent guests and I hope to hear from you in the future...have a wonderful, upcoming summer! If you are looking for a comfortable seaside place for a family vacation, I highly recommend Sea Gate! Yes, the condo is a bit worn around the edges in places, but we felt like this just added to the charm of the place! When we first walked out on that 4th floor balcony and saw that gulf and the white sand RIGHT IN FRONT OF US, we were SOLD! With 3 bedrooms, 2 LARGE walk-in closets (our granddaughter slept in one in her Pack & Play), 2 full baths (master is very nicely updated), & that wonderful wraparound balcony, our family had the best vacation we have ever had! Lots of extras, including the pool, washer/dryer, beach towels, toys, etc. The sunsets are breathtaking, and we slept every night to the sound of the surf. Tina is very accommodating and thorough in the information she provides to help you make the most of your stay. We WILL be back! Thank you for your kind words and for taking the time to write such a stellar review. I'm so glad to hear you enjoyed your stay...yes, the beach and the sunsets are awesome and such a beautiful sight to behold daily. God is good! I look forward to hearing from you in the future. I am the owner and manager of Sea Gate 408 condo on beautiful Indian Shores Beach. Indian Shores is centrically located between Clearwater Beach and St. Pete Beach...45 minutes from Tampa...where you can enjoy The Performing Arts Center, The Aquarium and Busch Gardens. All reservations are final. Trip Insurance is highly recommended.